Per usual, I have been too busy to blog at you people, so let me catch you up. There are just too many entertainment possibilities in Southern California to do them all, but it doesn’t hurt to try. We caught a one night only show called Return to Grey Gardens put on by Peaches Christ at the Wilshire Ebell Theater. It starred last year’s winner of RuPaul’s Drag Race, Jinkx Monsoon channeling Little Edie, and it was hysterical. Jinkx goes beyond camp in her acting abilities, and can sing like a Broadway star in a woman’s voice, which is pretty amazing. I saw a brilliant mash-up done by Peaches Christ years ago called Rocky Horror Superstar, which was equally freaky and wonderful, so I look forward to more of her theatrical drag productions. We went downtown twice this week for shows. Friday night we caught Rufus Wainwright’s tour at The Orpheum and it was fantastic. I have been listening to his music for years and this “best of” show made me realize the sheer volume of his catalogue. His younger sister Lucy opened the show and she is adorable and funny, as much a comedian as a musician. I’m a fan of Rufus’ voice, which many people are not, but his songwriting ability is unbelievable. There are not many modern artists that reviewers regularly compare to Cole Porter. Bring it. 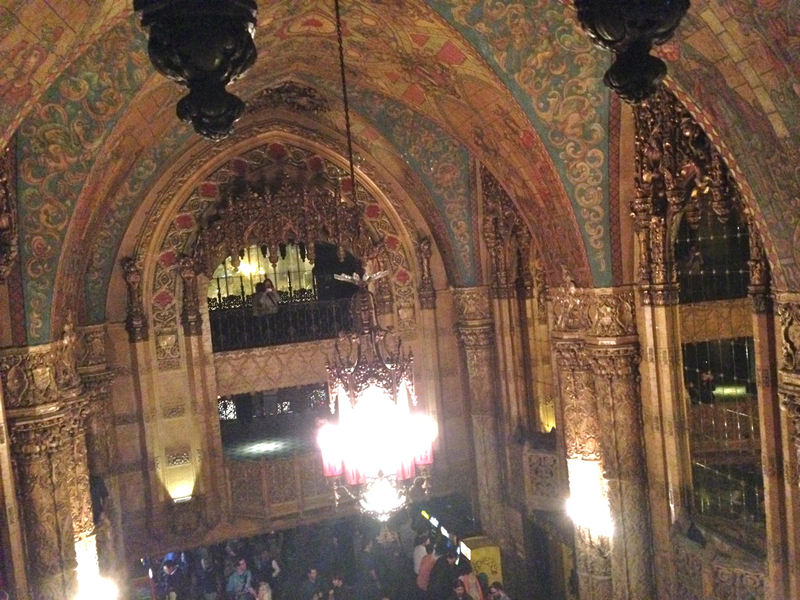 Last night we went downtown to the historic United Artists Theater at the new Ace Hotel. We went for a Cinespia screening of 1982’s Tron, which was almost impossible to sit through because it is so damn bad. The theater, however, is stunning, and, without a doubt, the most beautiful I have ever seen. If you get a chance to see something in this Spanish Gothic 1927 gem take it, unless it’s the movie Tron. This week we also headed to Westwood to catch Annette Bening in Ruth Draper’s Monologues. I am a huge fan of Bening, and she did not disappoint in this one-woman acting showcase. I was not familiar with Draper, or her monologues written between 1920 and 1956, which are wonderful and feel completely contemporary. Bening plays four completely different characters, and acts and reacts to an empty stage that she fills with her skill alone. The show runs through May 18, if you want to check it out at The Geffen. We also went to Coachella this year, so a big thank you to Steve for the VIP tickets! This years celebrity encounters included Lindsay Lohan, who was alone and made me sad, Jamie Foxx, Kellan Lutz, and the gorgeous Florence Welch. We had seen many of the acts in past years, but Coachella is always a blast in the desert. Even with all of the brilliant headliners like Arcade Fire, my favorite act of the year was a classic—The Pet Shops Boys. This past Sunday was Easter and we were invited to our friend Megan’s for a brunch on the rooftop of the historic Hollywood Tower. Albert and I thought it would be small, intimate group of people, and decided to wear our very large bunny costumes…for kicks. It ended up being a huge, fun bash and the rabbits were quite a hit. 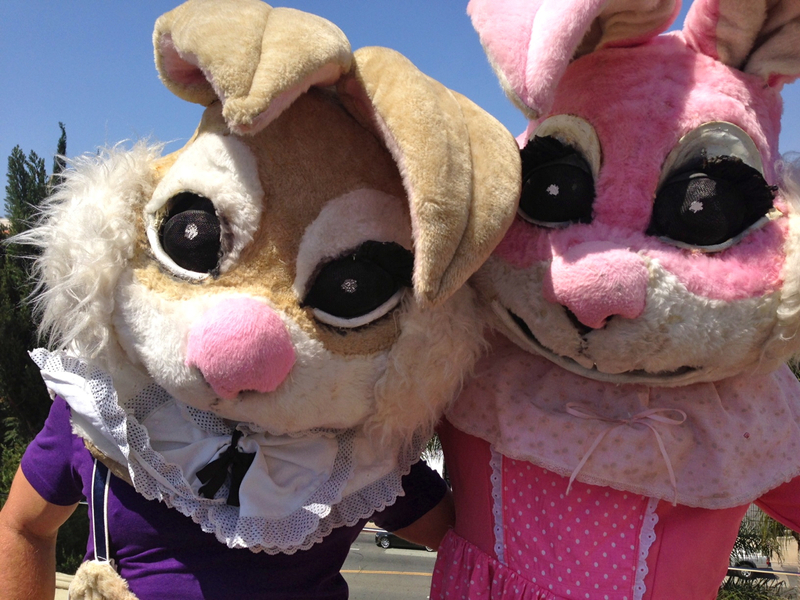 Cheri Oteri was one of the guests, and at one point was seducing Albert in his bunny costume, making for an unforgettable Easter.